Most of the edible products that can be found in Nova Scotia’s woodlands are either forest plants or mushrooms. Others, such as maple syrup, are derivatives of trees. Some, like honey and blueberries, were originally a forest product, but are now linked to agriculture. Forest-based foods in Canada have an annual value of over $725 million. If the value of foods that were originally forest-based but are now cultivated is added, the value rises to over $7 billion. The popularity of forest-based foods has its roots in the “wellness revolution” that began over a decade ago. People are increasingly concerned about the quality of food they eat, and it is to this market the organic foods industry owes its success. Many wildcrafters gather foods both for self-consumption and for sale. In some cases, competition can be stiff for gathering wild edibles when they are ready to be picked. For this reason, some wildcrafters have “secret” areas where a consistent supply of edibles can be picked year after year. If the plants you seek are on someone else’s property, it is very important to ask permission from the land owner. In many cases the owner may consider a sampling of your harvest to be adequate payment and much appreciated! If you are planning on harvesting NTFPs from Crown land, be sure to contact your local NSDNR office first. One of the most eagerly sought forest plants in Nova Scotia is the fiddlehead fern. Also called the Ostrich fern (Matteuccia struthiopteris), these plants are usually found near rivers and streams. They have a short season when they are at their best, which usually occurs during May. Good gathering sites are well-kept secrets! Fiddleheads are best picked when the head of the fern is still tightly coiled and no larger than three centimetres in diameter. Once they begin to uncoil, the heads become tough and fibrous, and begin to lose their flavour. The best quality fiddleheads are deep green in colour. The brown scales should be removed from the fiddleheads the same day they are picked. For storage, fiddleheads are often frozen or marinated. When picking, it is important to leave two or three heads per clump unpicked. This will help sustain the health of the clump from year to year. Canada's blueberry industry is valued at over $100 million, and Nova Scotia's lowbush blueberries are the most sought-after berries in the country. Many people consider blueberries to be one of the provinces's most important natural foods. While quantities of blueberries can be found growing wild, this product has been cultivated for many years, and specialty fields now supply almost all the commercial market. However, there is a growing demand for organically grown blueberries, and it is here that a woodlot owner gathering wild blueberries may be able to find a market "niche". Organic certification demands, among other things, that a three-year history of the site be retained, and that the integrity of the environment not be harmed by harvesting any product. Blueberry seeds are naturally spread across the landscape by animals and birds that have eaten the berries. It is sometimes puzzling to come across a patch of blueberries deep in the woods, but it is likely there because of bird activity. Recent innovations in storage technology have helped boost the blueberry market. Quick freezing of individual berries is common, which allows them to be stored for up to two years. Drying by a process called "sugar infusion" has made blueberries a popular ingredient of breakfast cereals and snack foods, and has substantially widened the market. The lowbush blueberry (Vaccinium angustifolium) has been found to have a number of health benefits, which has dramatically increased its potential market value. This will be discussed further in the Natural Health Products section of this module. Maple products: How sweet they are! Most people are familiar with the sweetest product to come from the forests of Nova Scotia. The culture and tradition of maple syrup production guarantees this product will always be in demand around the world. As people turn towards natural and more healthful products, many consider sugar derived from Canadian maple trees represents the very essence of vigour. The leaf of the sugar maple (Acer saccharum) has been a symbol of Canada even before it first appeared on our national flag in 1965. For example, it has been a symbol of sports teams and the Royal Canadian Air Force. The maple leaf has been an important marketing image of Canadian products, and there are few products more essentially Canadian than maple products. Maple syrup, maple butter and maple candy are all linked to Canada's maple leaf. With this powerful marketing tool, the potential for maple products seems limitless. Although Nova Scotia is not one of the largest maple producers in Canada (over 90% of the market share belongs to Quebec), the industry is a healthy one. Maple producers who have found creative ways to market their products continue to be on the cutting edge of the industry. The maple sap season in Nova Scotia lasts for up to six weeks during March and April. During this time, sugar-laden sap begins to flow from the roots of the tree upwards toward the buds, in preparation for leaf emergence later in the spring. It is recognized that the earliest flows of sap contain the most sugars and nutrients, and it is these runs that are critical to a sap-collector's success. A successful commercial sugarbush must contain at least two qualities: sugar maple trees and gravity. Stands of hardwood trees that are being considered for commercial production of sap must contain a very high percentage of sugar maple trees over 50 years old. They must also be situated on a slope so that the sap may run through lines to a collection point. The spile-and-bucket method of collecting sap is still used by small producers, and by people tapping only a few trees each spring. The sap must be collected daily or the sugars will ferment in the warm sun and ruin the product. Although labour-intensive, this method is cheap and family-friendly. A sugar maple tree can produce 3 or 4 litres of sap on an ideal warm spring day. Over the course of several weeks it can produce 35 to 45 litres of sap which, when boiled, will yield about a litre of syrup. It is generally recognized that 40 litres of sap produces, on average, one litre of syrup. If a tree is well managed, and not over-tapped, it can live and produce sap for well over a century. Few other natural resources are so sustainable! A 1993 study by the Nova Scotia Soils Institute indicated that only about 10 percent of tappable stands were being used for sap production. There is room to grow! Other tree species are sap producers, but on a much smaller scale. Red maple (Acer rubrum) and white birch (Betula papyrifera) sap can also be used to produce syrup, although it takes much more sap to make a sweet syrup. 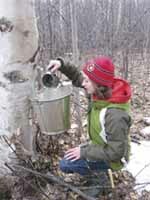 In the case of birch, the ratio is 100 litres of sap to one litre of syrup. Product prices also reflect this ratio, with birch syrup costing five times more than maple syrup. Niche markets exist for other birch sap products and "birch beer" (actually a type of wine) is one example. Forest Mushrooms: Fresh is best! In Nova Scotia, edible mushrooms command a fraction of the market share of other provinces. British Columbia, for example, exports over three times more mushrooms than all other Canadian provinces and territories combined. Given small but lucrative markets, however, local mushroom gatherers can make modest incomes. The most widely gathered edible mushroom in Nova Scotia is the field mushroom (Agaricus campestris). Found in pastures and on lawns, it is gathered mostly for immediate consumption. Field mushrooms are easy to identify and pick. Gathering mushrooms from a woodlot requires a good deal of knowledge. A good identification guide and a dash of common sense is usually needed to successfully gather fungi from the forest. Some mushrooms and other fungi are toxic to humans. If in doubt, play it safe and take the time to seek advice. The most commonly harvested forest mushroom is the chanterelle (Cantharellus sp.). Chanterelles are easy to identify and popular among enthusiasts. Gatherers will find retailers easy to locate, and will generally buy all you can offer for sale. Most retailers have guidelines regarding freshness and cleaning of the product, so it is best to check these details before gathering large quantities. Chanterelles can be found under almost any mature forest stand. The presence of white spruce seems to be an indicator of a good collection site. Old fields that have become mature white spruce stands are often good bets, particularly where the old field joins other forest cover. Many good chanterelle sites are destroyed by overenthusiastic harvesters. While activities such as raking allows the rapid collection of mushrooms, it often breaks up the important mat of fungi just below the ground;s surface. It is from this mat, called the mycelium, that mushrooms emerge above the ground. Cutting the mushroom off at its base is the best harvesting method. Pulling the mushroom out of the ground will damage the mycelium mat. The visible part of a mushroom may be only a fraction of its actual size. The mycelium may extend below the ground for a number of metres in all directions. It is important to leave this part intact, as the mushroom forms important beneficial symbiotic relationships with trees, by tapping into roots for nutrients and providing other nutrients to the tree in return. Other mushrooms that are collected in Nova Scotia's forests include boletes (Boletus spp.) and shiitake mushrooms. Shiitake mushrooms are produced by inoculating decaying wood with spores. These spores eventually give rise to the fungal mycelium, which then produces the fruiting bodies, or mushrooms, on the surface of the wood. Shiitake mushrooms can be a valuable product, but can be difficult to cultivate. Getting mushrooms quickly to market is an important factor in receiving a good price. It is important to remember that "fresh is best". If the mushrooms are clean and dry, they will often store in a refrigerator for up to 10 days. The cost of storing a quantity of mushrooms in a cooler can escalate rapidly and take away from any profit. For this reason, reliable and flexible markets are needed. Although good data is difficult to obtain, over $25,000 in forest mushrooms were exported from Nova Scotia in 2002, compared to $800,000 exported from British Columbia. Other woodland edibles include wild strawberries (Fragaria virginiana), which are popular with many wildcrafters during the summer months. The white flowers are often used for decorative items, and the berries can be eaten fresh or dried. The leaves can be used to make an herbal tea. Berries from the wild rose (Rosa virginiana) can be made into jams, syrup and jellies. These bright red berries, called hips, are 25 times richer in Vitamin C than oranges. For maximum flavour, the hips should be picked right after the first frost. The petals of the flowers can also be used to make herbal teas, or can be soaked in cold water to make a "julep". Wild rose bushes are fairly common on old farm sites and in open woodland. Chokecherries (Prunus virginiana) are considered by many people to be unpalatable, although the ripe berries make good jellies and jams. They are easy to find and pick, an the bush that some people consider a nuisance, can be put to good use yielding a product that could be popular at farm markets. Highbush cranberries (Viburnum sp.) are actually members of the honeysuckle family and are not true cranberries. Rich in Vitamin C, highbush cranberries make flavourful jellies and in many cases can be substituted for real cranberries. All of the above berries can be processed into added-value products such as jams and jellies. These are popular items at bake sales and farm markets. Many of the wild edibles found in Nova Scotia's woodlands have little potential as bulk commodities - they are simply too susceptible to over-harvesting. When in doubt, go slow, and do not pick more than you need. Doug and his wife Frances live in Halifax, where Doug works as a pharmacist and Frances works out of their home as a fitness and nutrition consultant. They own a 121-hectare (300-acre) woodlot in Pictou County that had been in Frances' family for a number of generations. Their two teenage sons are very interested in the out-of-doors and relish the chance to visit the woodlot whenever they can. They especially love the rolling hills of sugar maple and how these contrast with the site of the old farm, which is now overgrown with dense stands of mature white spruce. For a few years, Doug and Frances had tapped 25 or 30 maple trees using the spiles and buckets that Frances' father had owned. When Frances was still very young spring was a celebration of sorts, and in late March the whole family would snowshoe into the hills and tap the best-looking trees. Usually they would get enough sap to make a small amount of syrup and candy, and Frances loved the daily ritual of tramping up the hill behind the farm to where the shiny buckets hung from the spiles. They would put the buckets on a sled and take them to the house where big pans of boiling sap filled the air with a sticky sweetness. This "sugar-time", as she loved to call it, became one of her fondest memories. During the 1960s the family , like so many others, left the farm and moved to a comfortable house close to town. With the passing of time, the house and barn fell into ruin and the fields became covered with trees. Doug and Frances began visiting the old place soon after they were married, and Doug built a camp near a brook at the foot of the hardwood hill. Six years ago, Doug had the chance to purchase a used evaporator tank that he had seen advertised in the pages of Rural Delivery magazine. He had always been interested in trying to produce maple syrup on a larger scale, and he felt it was worth a try. By the time he had bought new sap collection lines, connectors and taps, he had invested several thousand dollars. That first winter was hard work. Together with the boys, Doug identified the trees he was going to tap, laid out the collection lines on the snow, and made sure that they all fed into one large pipe that ended at the shed housing his evaporator. They then drilled tap holes in the trees, the diameter of each tree determining the number of taps. No tree that was less than 30 cm in diameter at breast height was tapped. A second tap could be placed in trees that were 45 cm in diameter. Only one tree on the hill could handle three taps, and that tree was enormous! They chose trees that appeared healthy, with little sign of ice-damaged crowns or presence of maple borers, which are insects that tunnel beneath the bark and partly girdle maple trees. Their maple bush lay on a southwest slope, which gave excellent exposure to the winter sun during the day, and a good chance for cold nights and early mornings. During the afternoons, the sap should run well. Doug had heard many theories about what should make his sugarbush successful: the southwest slope, cold nights and warm days, and good snow cover to keep the sap stored in the roots until it began to flow in late spring. He had also heard that rocky slopes make the sweetest sap, and he hoped that the small rocky outcrops on the hill would help. Because the stand of maple contained trees of all ages, Doug and the boys had to clear some of the younger trees to allow the lines to pass among the larger maples. They were careful not to create openings in the tree canopy that were too large, since the increased light and warmth would cause other trees to grow quickly into these openings. A particularly challenging tree to control was beech, which seemed to grow everywhere on the hardwood hills, but never amounted to much more than a large shrub due to beech bark disease. It made excellent firewood, however, and Doug always made sure that he had plenty of it to use with his evaporator. Doug knew a maple sap producer who had thinned the trees in his sugarbush to help increase their growth. Most of the maples were only 50 or 60 years old, and were still growing vigorously. They had spaced the trees so that there were three or four metres between the crowns, allowing room for the crowns to expand. The trees had responded well and the sugarbush was producing good runs of sap. An annoyance, however, was the amount of beech, yellow birch and other trees that had started to grow densely in the understory. Every few years, these trees had to be cleared away to prevent damage to the collection lines and to maintain access to the tap trees. Doug had kept his own thinning to a minimum because his sugarbush contained a range of tree ages. His best trees had large crowns that were unlikely to expand further. Doug, Frances and the boys had made their trips to the sugar camp a spring ritual. With over a thousand taps to tend, there was always something to be done: flushing out the lines first thing in the spring, making sure that deer had not unsprung the lines, and finally drilling the trees and connecting the taps. This work was often done on snowshoes or by snowmobile, and the air was filled with expectancy as the taps were hammered into the fresh holes. The first runs were always the best. The sap came gurgling out of the main line into the holding tank with surprising energy. These runs were also the sweetest: when the sap was boiled down, the syrup it yielded was a gleaming light gold. It took 35 litres of sap to make a litre of syrup early in the season. A week or so later, 40 litres were required, and the syrup was darker in colour and a bit heavier to the taste. As the days got warmer it was important to make sure that sap did not stay in the lines where the sun and heat would ruin it. As a business enterprise, Doug and Frances are pleased with their investment. By bottling and selling their own products in the form of maple syrup and candy, they make a profit of $5000 each year. Of far greater importance to them, however, is the enjoyment they get from this activity. "Even though it's hard work, sugar season is like a vacation for us," says Frances. "We get out of the city, into the fresh air, and see the spring opening up. The money is not great considering the time we put into it, but the boys really enjoy the lifestyle and getting into the woods. It's a perfect excuse for a family getaway." Besides the sugaring, Doug and Frances have another cash crop on their woodlot. Among the spruce trees not far from the stream, gold gleams in the shade of the trees during August. These are chanterelle mushrooms, a delicacy among those who like them. The trumpet-shaped fungi are found in patches here and there, growing among the roots of the trees that are their shelter. The visible chanterelle is the fruiting body of the mushroom which releases spores, like seeds, for reproduction. The living bulk of the fungi is found within the soil, where roots called the mycelium make the mushrooms an important part of the forest floor. Weaving among other roots of trees and ground plants, the mycelium is a vital connection between many subterranean forms of life. While spending time at their camp during late summer, Doug and Frances hunt for chanterelles. Sometimes they find a newly established patch, but it is the older patches that are most reliable. Even during very dry years they can expect to collect up to $300 of chanterelles. Of course, summer would not be the same without a couple of "fry-ups" of chanterelles. Frances has experimented with ways of cooking the mushrooms, and finds that they are excellent in a stir-fry, mixed among vegetables and fruit. Doug likes them lightly pan-fried alone, with a bit of pepper. When they are gathering chanterelles, the family is careful not to over-harvest the mushrooms. They have heard of some people that gather chanterelles commercially by raking them, but this destroys the below-ground mycelium that is crucial to keeping a patch healthy. It is also important to leave a few of the mushrooms themselves intact, as their spores will help establish new patches in the vicinity. Doug and Frances sell the bulk of their chanterelles to a retailer. Frances finds that chanterelles freeze well, and she usually puts away a few pounds for eating during the winter. "It reminds us of summer," she says. "You know, we have the best of both worlds - golden syrup in the spring and golden mushrooms in the fall!"